Classic outback track with settlements conveniently spaced and plenty of railway detritus, and natural history along the way. Not as remote as the Tanami or Great Central Roads but much more interesting than plodding up the Stuart Highway. The essential Hema Great Desert Tracks of Australia South East map is highly detailed. Also Adam Plate’s Pink Roadhouse annotated mud maps of the track are very useful to show the history and features of what you are travelling through. Allow 9 days riding to allow time looking at the scenery and rummaging around at the bridges and railway junk. With a load 75km a day is enough in the often soft and corrugated conditions if you want to camp at William Creek or Oodnadatta. If you are lightly loaded you should be able to make it in 6 days. An extra day off at Oodnadatta is worthwhile. March to November inclusive. It’s way too hot in summer. Travelling north makes the most of the prevailing southerly winds at that time of year. These can be plenty strong at times. 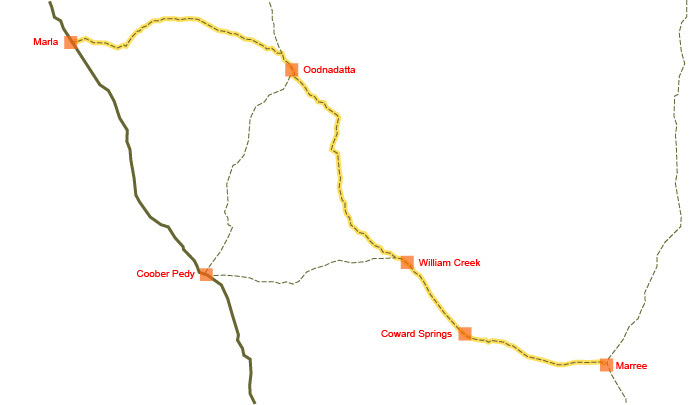 Oodnadatta Track in orange. Permanent water points shown. The road gets an occasional grade which is not always good news for those on a bike, ie, it fluffs up the soft stuff and hides any hard section. No sand but sometimes soft in places. The occasional stretches of corrugations rarely go from one side of the road to the other and can usually be avoided. The road is generally rideable even if at times you are on the wrong side of the road. Well, mostly on the wrong side of the road. It can be gravelly in places as well but with flat fat tyres you will be able to ride it all, no worries. Drinking water is available at Marree, Coward Springs, Oodnadatta and Marla. You can get water at William Creek but officially you have to pay for it. Better to stock up in Coward Springs. Any creek water is usually more salty than the sea. The last real supermarket is at Leigh Creek but Marree has a good community store. Just a pub with counter meals at William Creek. 2 patchy stores at Oodnadatta. Roadhouse at Marla. Paid camping at Marree, $12pp; Coward Springs, $8pp; William Creek, $8pp; Oodnadatta, $12pp. Bush camping otherwise pretty well anywhere. Dead, dry firewood is around. You cross the 5,614 km long Dingo exclusion fence. Umm, it’s a fence, not exactly the Great Wall of China. The strange mega, and that really is Mega, sculpture park at Planehenge. Plenty of old railway memorabilia from the original Ghan railway, discontinued in 1986, along the way, ruins of old stations, bridges, desalination tanks etc. There’s a 60km excursion each way on a rough 4WD track to North Lake Eyre for those who aren’t satisfied with just seeing the South Lake Eyre saltpan that’s close to the track. Not much at all when you get there other than a very distance horizon. Sitting in the 26ºC natural springs at Coward Springs is a relaxing way to finish the day. For those who can’t stand to travel in a straight line there is the possibility of turning off just after William Creek to the whacky underground township Coober Pedy and then returning to Oodnadatta via the Painted Desert. Take care with carrying enough water to last between the known watering points, ie Marree, William Creek, Oodnadatta or Marla. Ain’t nothing else along the way, except from what you scrounge off those 4WDs. These 24 images give a general impression of the road conditions you are likely to encounter out there. And just a few pretty pictures too.